Ask fellow campers about "Shenandoah Valley Campground" and nearby attractions. The campground is reasonably near I81, nestled in the Middle River valley. The campground is all about that river, which is a gentle stream, perfect for tubing most of the time. 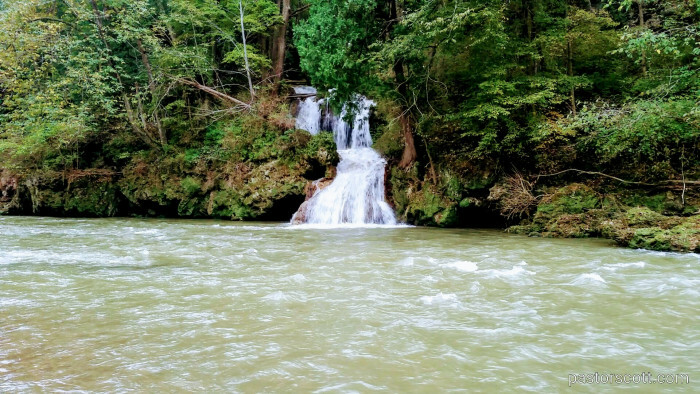 Then, near the popular tenting area is the real gem of the campground: a beautiful waterfall dropping in from the higher ground opposite the campground. Our stay was brief and in the week following heavy rains from what was Hurricane Florence. 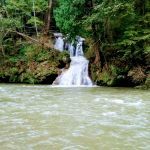 With the river running high (and it was flooding the campground in the days prior to our arrival), the waterfall was stunning. We stayed in the section near the store, which is above the large camping area on the river. 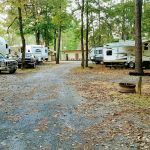 After the Hurricane Florence related flooding the campground staff worked many hours putting fresh gravel down throughout the large water-front area of the campground which is all gravel - roads and campsites. This is a destination campground with a large, heated pool and several hot tubs located indoors. There's also a nice fishing lake and a couple of playgrounds. The kids have a blast bike riding, fishing, tubing, swimming, and feeding the many mostly-tame rabbits. WiFi is slow and only available in the campground store. My Verizon signal was poor to zero. I got a satellite signal but due to the trees not many people would. The biggest negative for us is that the sites themselves are pretty tight with neighbors very close in on both sides. After a night of rain on Saturday night a staff member knocked on our door telling us that the entire campground was being evicted by the sheriff's office. The issue wasn't flooding in the campground. Rather, it was the county road leading to the campground that was in danger of going underwater. We were told that we needed to be out within the hour. This wasn't any fault of the campground and I'm not under the impression that it happens very often. Also, from their website, I think they were only closed one day. We give this campground a thumbs up, but did feel it was rather expensive. We camped at Shenandoah Valley Campground in a Fifth Wheel. Lots of level sites except the one we got along the road. We could not get our Motor Home level but it was fine for one night. Very slow check in. We camped at Shenandoah Valley Campground in a Motorhome. Ask to see your site before you try to set up. They have lots of level sites but quite a few unleveled ones also. Nice sites on the banks of the river. Tube and raft rentals. Fishing pond catch and release. Overall a very good choice. large private campground with hills, trees, river, etc. that give a state park feel. River tubing is just wonderful, about 25 minute lazy drift that ends at a natural waterfall. The river is "U" shaped and wraps around the campground that is walkable from beginning to end so you never leave the campground. Don't know of any campground that has such a serene, natural, tubing experience. Tube rental is just $10-day, and I highly recommend not using your own department store tube as it will most likely tear easily in shallow parts of the river. Wild but friendly rabbits throughout the property, rabbit holes with litters of baby rabbits, your kids will go nuts over them. Pool is clean, and especially large, a very large kid pool, and a hot tub room with 4 clean tubs. A very well stocked park store, with very reasonable pricing across the board. Golf cart rental available, but a bit pricey at $55 per day. Free cable TV hook up works well and is a nice amenity for rainy nights with the kids. A few challenges include non-existent wifi that only works if you stand a few feet from the counter, from inside the campground store. $100 for an up to date router would solve this problem, but that simple solution seems to elude campground management. 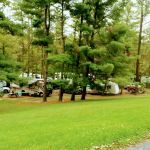 When the campground is busy, toward the weekend, it definitely feels like a cramp private commercial rv park, the spaces are on top of each other, compact with barely enough space for one car, which in turn sacrifices your already cramped social space. No evening or morning quiet hour so expect the probability of loud talking and music a few feet away, as the resemblance to a state park slips away. A dozen games and candy machines with out of order signs, and others that are purportedly working but take your coin nonetheless, and management says they have no control over it to refund your money. No recycling anywhere on the premises... We camped at Shenandoah Valley Campground in a Travel Trailer. Seemed to be very full of rigs and full of families. Lot of kids enjoying themselves and many tame rabbits. Was too close for us and we barely had room for RV and car which was unhooked. Good for overnight stay and we stayed there weekend prior to July 4. We camped at Shenandoah Valley Campground in a Motorhome. This is a VERY impressive RV park with alot of kid friendly things to do. There is a pond to fish that is with carp, trout, and bass. There is a heated pool. The best part is it is very very friendly, with trees, and a river that runs thru the rv park. And in the middle of the river near the site---a WATERFALL !! There are hot tubs for the adults and a heated (if needed) pool for kids. One of the best parks we have ever visited to RV in. Roads a little narrow to navigate at certain points but doable. We camped at Shenandoah Valley Campground in a Fifth Wheel. Walmart nearby we were told but never visited. Nice, clean park with lots to do for kids. Our site was a bit short for our 40' FW, but we managed just fine. The sites were pretty close though. They have a heated pool and a hot tub house that has 4 clean hot tubs to relax in. Not something you usually find at an RV park, so it was a treat! They had wifi, but it didn't work so well in the lower part of the campground for the sites down by the river (where we were). We would definitely stay here again but would ask for a site that was a bit longer. We camped at Shenandoah Valley Campground in a Fifth Wheel. We did a one nighter here . Not the most fun to access. Rather wiggly access road and a bit off the interstate. Sites were short, shady and nice on a a small river. Width was fine for us. We are about 55 feet towing and barely fit in their largest pull through- but we made it. It was very quiet. Good wifi and cable. Seemed a bit over priced for us considering the level of development for the park, but the staff was very helpful getting us the best they had on short notice. It's a great place for a family with youngsters to plop it down to play for a few days. AT&T cell only worked occasionally if you walk up to the beautiful pond, stand on one foot, and hold your finger up in the air. We camped at Shenandoah Valley Campground in a Motorhome. There are a couple campgrounds named Shenandoah Valley Campground. This is the one in Verona Virginia. It is very large. We have a smaller 5th wheel at just 35ft and we had difficulty navigating the roads inside the campground. The top of our 5th wheel hit several branches hanging low. The sites are close together and there is very little space to sit and enjoy the outdoors. We had a pull through site and had major difficulty getting out of it. The turn we had to make was too sharp and we had to move some trash cans to get out. We were there in October and there were lots of families with lots of little kids running and screaming. There are also lots of golf carts zooming around everywhere. Luckily we only stayed one night. We will never go back! We camped at Shenandoah Valley Campground in a Fifth Wheel. This is a nice park, The sites were level gravel but tight. It was very quite. We stayed 2 nights to visit the national park. The only negative was the distance from the interstate but we would stay there again. We camped at Shenandoah Valley Campground in a Motorhome. 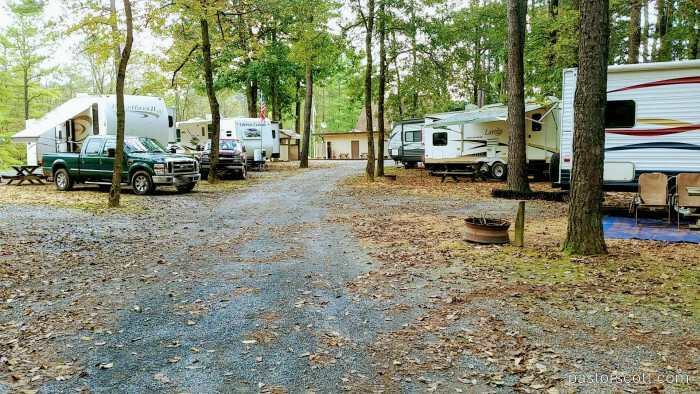 Quiet wooded campground with nice pool, laundry and 4 hot tubs! The campground had few campers on the Sun & Mon. when we visited so we had our choice of hot tubs to soak in while our laundry was washing / drying in the adjacent laundry room. The FHU pull-thru sites by the river are narrow and close together, but OK when we visited as the adjacent sites were empty. We camped at Shenandoah Valley Campground in a Motorhome. Nearby Verona has drugstore, gas stations and some shopping/dining. Staunton is just a few miles further for a larger variety. Very nice family park hidden back in the woods! Roads curvy but navigable Stayed overnight and saw lots of families and children enjoying the activities. Lots of tame rabbits! Mostly trailers and 5th wheels of folks familiar with the area. We camped at Shenandoah Valley Campground in a Motorhome. If you are looking for a campground to take the kids to that offers plenty of activities, this is the place. From renting golf carts, tubing down the river, arcade, put put golf, swimming pool and hot tubs, there is PLENTY to do. Not to mention karaoke and a DJ for dancing, the campground offers many activities. During our stay the campground was very close to full and surprisingly, very quit in the evening and night. Parking within the sites would be somewhat tight but manageable. Trash cans were convenient throughout the grounds and picked up twice a day. Restrooms and showers were clean, no lack of hot water. We would stay here again. We camped at Shenandoah Valley Campground in a Fifth Wheel. NOTE: there are TWO campgrounds named Shenandoah Hills fairly close by; this review is for the one in Verona. The other Shenandoah Hills is in Mount Jackson, Va, near Route 11 Chips and Shenandoah Caverns, just so anyone thinking these venues are close to the Verona Shenandoah Hills. This is a beautiful location along a very nice river with rabbits running everywhere. A very quiet park well off the interstate. The sites are very narrow and very tight. If you do not pay close attention to the trees surrounding your site, then you will add to the removal of bark from the too close trees. All in all it seems like a great place to take a family for a fun time with the river tubing in the summer. I would stay again but only if I couldn't find a closer campground. The park does not justify the cost. We camped at Shenandoah Valley Campground in a Fifth Wheel. WONDERFUL RV Resort full of activities, beautiful facilities and grounds. Grandkids loved pool, playground, tetherball, basketball. Outdoor movie. Great sites, Spacious, level, clean. Friendly, helpful owners and staff. Snack bar with grill. Well stocked camping store. Great visit, highly recommmend, will return. We camped at Shenandoah Valley Campground in a Motorhome. Down in a valley. Very little at&t or verizon service. Nice park with lots of things to do for the kids. Bunnies everywhere. Weak wifi. No problems navigating 42" fifth wheel. Nice camp store with basic stuff on menu to order. Hot tubs and heated pool. Nice water fall on property. Would stay again if in area. We camped at Shenandoah Valley Campground in a Fifth Wheel. If you haven't explored Shenandoah National Park, please know that you can't comfortably drive it in one day. It can be done in thirds. A pleasant driving trip for one day from this campground, would be to start at southern Rockfish Gap entrance and head north for about 30 miles. Then head back south on the highway or through the valley. Dont use GPS! We have a Garmin RV 660 and it directed us to an impassable area. Use directions from Campground. I've seen a few comments about how far the campground is from town. It's less than 2.5 miles from the interstate. In that 2.5 miles there are several gas stations, restaurants, ACE Hardware, Dollar General, Goodwill, Food Lion, McDonalds, Rite Aid, and several other specialty stores. A Wal-Mart is 5 miles down the interstate if you really need something. Easy / short walk (along the roads) to Rt 11 Chips and Shenandoah Caverns. Wineries nearby too. If you're in a small rig and don't need a hookup, check out the tent camping area. 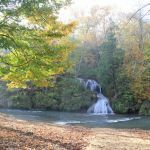 You might be able to score a site with a view of the waterfall that cascades down into the river form an opposite bluff. Unless you have kids and want a lot of activities for them, avoid this place. 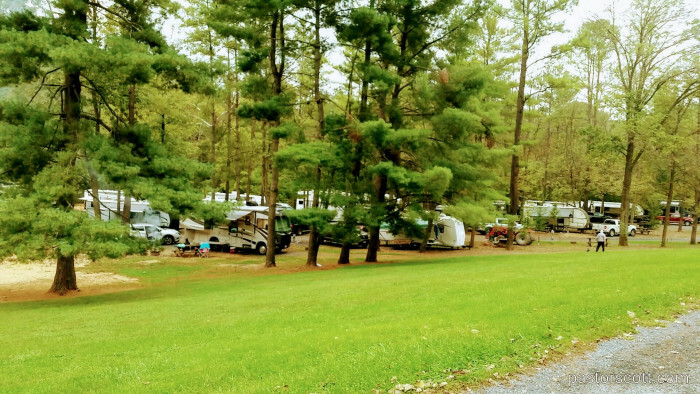 Are you affiliated with Shenandoah Valley Campground ?